Despite the current bull market — the longest in history — many Americans are reluctant to invest their hard-earned cash in the stock market. There are variety of factors at play here, including negative experiences during the 2008 financial crisis, insufficient funds and a even just a lack of financial education. The stock market is constantly in flux, making it difficult to pinpoint the most up-to-date facts, so we curated this information to provide a stock market summary — everything from the size of the global stock market and the different countries/companies that make it up to the people who invest in the stock market. Nearly all countries participate in a global stock exchange that allows for both local and international companies to be traded. The number of traded companies varies, usually proportionately to the size of the country, but can vary from a couple hundred to as many as a couple thousand. The stock market status can fluctuate at any given time, but here are some current statistics regarding the global stock market. 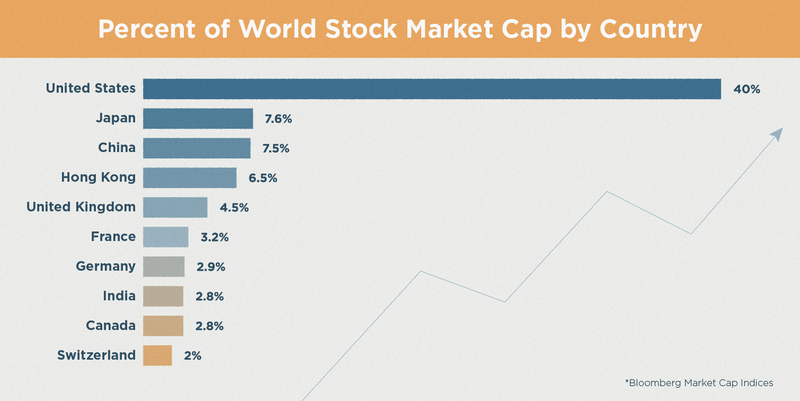 Unsurprisingly, the US stock market is the largest and most expensive in the world. Despite this, the US economy isn’t the most productive. China has surpassed the US as the most productive economy in the world with a $23 trillion GDP compared to the $19 trillion US GDP. Here are some important statistics regarding the US stock market. The stock market today is dominated by tech giants like Apple and Amazon, but it hasn’t always been that way. According to the Washington Post, the big five tech companies have risen above big energy for the first time. The stock market is notorious for its cyclical pattern of bubbles followed by crashes like the dot-com bubble and the US housing bubble, but here are the current industries and companies dominating the market. On any given day, stocks have roughly a 53 percent chance of rising and a 47 percent chance of falling. Over any given 3-month period, stocks rise 68 percent of the time, dropping the other 32 percent of the time. Over a typical 12-month period, the odds of making money in stocks rise to roughly 75 percent. If you are in the market for a long enough period of time, there is a 100 percent chance that you will experience temporary price declines at times. 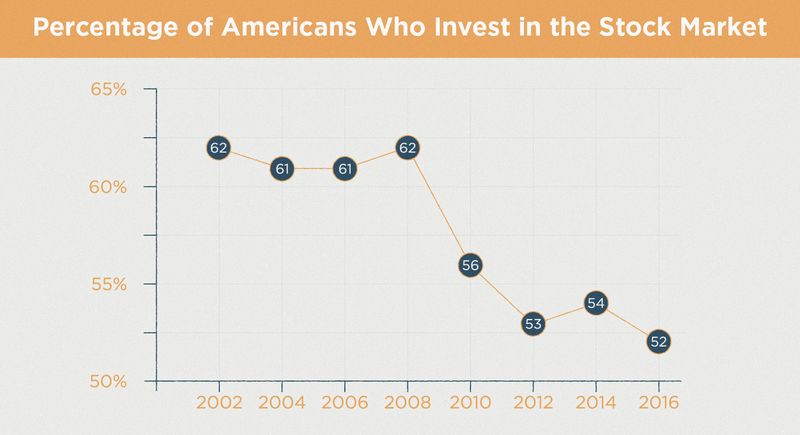 Despite clear economic advantages over traditional savings accounts, many Americans aren’t investing in the stock market. This could be a result of not enough capital or, for many Americans, simply a lack of knowledge. If recent reports are any indication, understanding the stock market is not many Americans’ strong suits. According to our investment literacy survey, nearly half of Americans don’t even understand the basic financial markets, which is crucial to understanding the market as a whole. That same survey also showed that three quarters of Americans don’t understand bonds — the least risky investment type. Even among those who do invest, 52 percent rebalance their stock portfolio more than once per year, which can result in unnecessary fees and negative tax consequences. Even more worrisome, 42 percent of investors don’t know how their assets are allocated in their portfolios. All economists agree that predicting stock prices is tough; however, only slightly over half (59 percent) of Americans agree with that statement. Figuring out how to invest in the stock market — or if you even should — may seem like a challenge for most Americans, but the rewards can far outweigh the time it takes to put in a little research. In fact, according to Investopedia, if you don’t start saving until 45, you will need to save three times as much as if you start at 25! While starting early is great, it’s never too late to catch up on retirement or invest in a mutual fund. Taking control of your finances will help you feel more empowered to make smarter decisions along the way.